This calculator was introduced one year after the TI-5100 and features 12 digits of display size instead of 10 digits. Dismantling the TI-5200 reveals a similar printed circuit board (PCB) like the TI-5100. Main difference is the 40-pin TMC1278 instead the 28-pin TMC1073 of the famous TMS1000 Microcomputer family. The reason is found in the necessary lines to drive the 12-digit Fluorescent display. 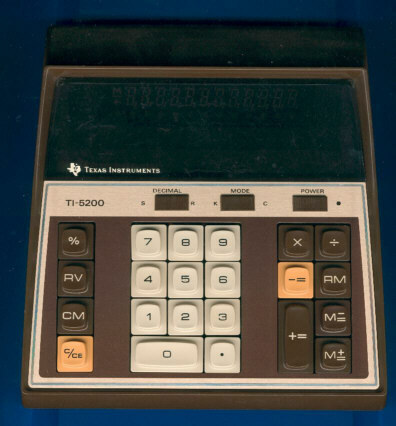 About 6 years after the introduction of this TI-5200 its successor TI-5200 II hit the market.